Click to see this year’s finalists! the signature event ―a juried process held this fall to select the winning proposal to receive a $125,000 grant. In response to these challenges, and building on the 2016 and 2017 NLCCs, the focus for this year’s event is once again on initiatives that address youth unemployment. In particular, proposals should include significant collaboration among organizations and between sectors; and the resulting programs, tools, and services should contribute to long-term improvement in outcomes for youth and employers. The 2018 NLCC is a collaboration between the Ottawa Community Foundation and the RBC Foundation. Include credible measures of success: the proposal provides outcome-oriented performance indicators, and a measurement/tracking plan. The proposal does not need to specifically target particular populations of youth. However, the proposed initiative should benefit those who are more likely to be at a disadvantage in accessing and maintaining employment, and in developing meaningful career paths. The following are the top three projects submitted for the 2018 New Leaf Community Challenge. Note that some proposals are collaborations between multiple partners. In those cases, the listed organization is the lead. Youth+ is an initiative of the Ottawa Community Housing Foundation (OCHF), in collaboration with Youth Futures (YF) and Global Vision (GV). Building on the strengths and successes of the YF and GV Connects programs, it will support 180 youth from diverse, low-income backgrounds to pursue careers in Ottawa’s fastest growing industries such as IT, clean technology, and tourism. Youth+ will offer industry roundtables, local industry tours, internship opportunities; hands-on training in areas such as leadership and entrepreneurship; and opportunities to connect with peers internationally. This initiative will help connect youth to a range of “green career” opportunities in Ottawa. Delivered through school-based programming, Green Collar Careers (GCC) will build awareness of a broad range of environmentally-oriented career opportunities and pathways. For those youth wishing to explore these opportunities in more depth, it will provide career-oriented skills development, coaching, mentorship and volunteer opportunities; and will pair interested youth with industry representatives. For employers, GCC aims to build a pool of trained, skilled labourers interested in working in green industries. GeneratioNeXt Ward 13 is a bilingual employment and entrepreneurship incubation program offering services to youth aged 13 to 29 years old. The employment track connects employers and youth; gives youth access to skill development and hands-on training; offers space and support to youth; and works with partners from the public, private, and non-profit sectors on a city‐wide strategy to address systemic barriers to youth employment. The entrepreneurship track helps youth explore self-employment as a viable career; learn from business professionals and educators in a supportive environment; develop a business plan; create a business; and access low-cost financing. 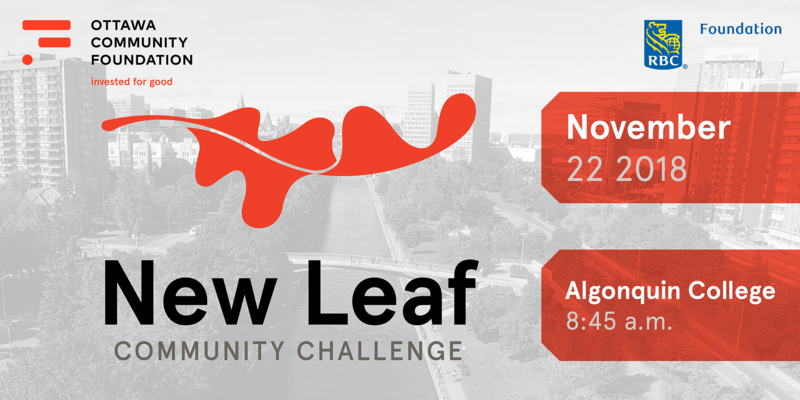 The 2018 New Leaf Community Challenge will be held Thursday, November 22nd from 8:45 a.m. to noon, in the Indigenous Learning Commons at Algonquin College. The event includes a presentation by each of the three finalists, followed by the jury decision. Click here to RSVP.